After reading this scene from Thunder Rolling Down the Mountain, the teachers wondered if Willow students had a clear idea or picture in their minds of what it was like for these people to cross the river. It seemed like a great opportunity to use PE materials and small group work to build understanding of the event and strengthen relationships within the classroom community. I wondered what would happen if I offered groups a limited number of materials that might represent the raft, horsemen and stream current and then asked children to recreate the scene as a group challenge. They were given one hula hoop, one jump rope, and four poly spots to work with. Initially, the students were quiet, but before long, ideas started bubbling up. They decided pretty quickly that the hoop would represent the raft, but then they began talking about the rope and the horsemen. Alex: We could tie the rope to the hoop. Leo: and then to the horseman. Wait, how many horsemen are there? Jackson: What if we had each of the horsemen holding one end of the rope and ran the rope through the hoop? Winslow: And they could also hold the poly spots and lay them down as they cross. The horsemen could only walk on the spots. The passengers in the raft have to stay inside the hoop. Amy: Is it challenging enough for the passengers if they simply walk along inside the hoop? Winslow: They have to hold up the hoop with one hand and keep it at waist height. Felix: How about if they can’t use their hands and they just hold it with the back of their knees like this (demonstrating that he and another student could walk together with the hoop held only by the crook in the back of their knees without using their hands)? Liz: I don’t think I can do that. Rick: It’s okay, you could be a horseman instead, Launa. You don’t have to hold the raft with your knees. Once everyone was clear about what the parameters were and who was in each group, we set out to cross the paved part of the playground (the “river”). I was amazed at how the children were able to work together, accommodate one another’s needs, listen and move through frustration when someone “fell in” and they had to start over. I wondered aloud how they did it. The students reminded me that what they were doing was part of a storyline. When you have a storyline in your head, it is easier to complete a challenge with your group. The next day I asked, How were you able to recreate a complicated scene from a historical event using only a few PE materials? Rick: The materials we were given could act as what we needed them to be. The hard part was doing the challenge, but the materials made it easier. Ollie: Yeah, the materials were self-explanatory. Laura: It helped that we were already thinking about the story. When you said we would reenact that scene it felt okay because I was already familiar with the story and my group was too. When children have the Chief Joseph storyline in their heads and are able to then reenact a river crossing with materials on a playground, I think they have a better understanding of what that must have been like. They might begin to imagine more clearly the characters in this story and the decisions they make. They might be more able to take their perspective. Looking ahead, I wonder how this work might transfer to other classes. How might I connect PE to project work in other settings? 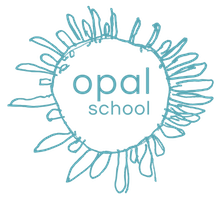 How does the physical work support the intellectual work that we do at Opal School?